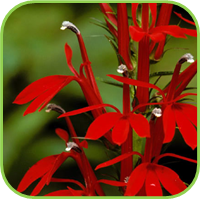 A clump-forming plant with long flower spikes opening to butterfly shaped flowers all year round. Belleza pink has attractive, deep red foliage. Drought tolerant and hardy. 3L bag. Perennial. H:60cm W:40cm. Besides being delicious to eat, this plant makes a handsome addition to the herbaceous border, with its grey thistle leaves. The flower heads are the vegetable. 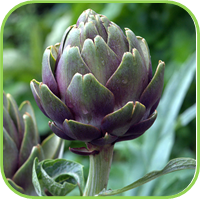 Once it has finished flowering cut the plant back, new plants will form next to the main stem. 4L bag. Perennial. H:40cm W:40cm. A dwarf, semi-evergreen groundcover. It has a creeping growth habit, forming tufts of grey-green, hairy leaves. 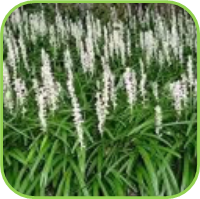 From late Spring to early Summer, it produces small, pink-flushed, white, trumpet shaped flowers. 3L bag. Ground cover. H:15cm W:15cm. 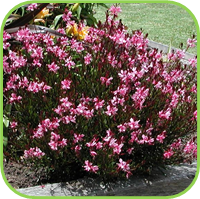 Semi-hardy, low growing shrub, glossy dark green leaves with maroon on the reverse. Spikes with clusters of dark purple flowers in spring. 3L bag. Shrub. H:30cm W:40cm. Semi-hardy, low growing shrub, glossy cream and green leaves. Spikes with clusters of purple-blue flowers in spring. 3L bag. Shrub. H:50cm W:50cm. 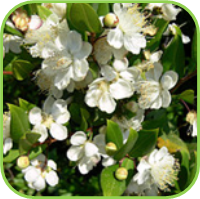 Semi-hardy, low growing shrub, glossy cream and green leaves. Spikes with clusters of light lilac flowers in spring. 3L bag. Shrub. H:1m W:0.8m. Semi-hardy, low growing shrub, glossy green leaves. 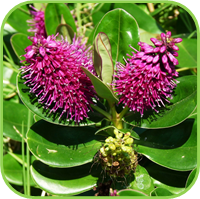 Spikes with clusters of deep magenta flowers in spring. 3L bag. Shrub. H:80cm W:50cm. A colourful display from spring to autumn. 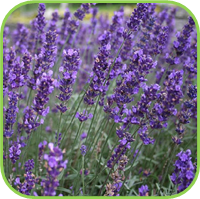 Ideal for landscaping and mass planting. 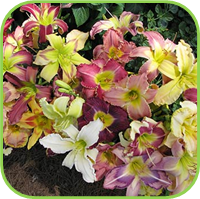 Flower colours range from bright yellow to orange and dark purple-red. 3L bag. Perennial. H:40cm W:40cm. An evergreen climber that produces an abundance of reddish-pink flower buds in late winter and early spring, followed by fragrant five-petalled star-like white flowers which are about 2cm in diameter. 4L bag. Climber. Creeping. 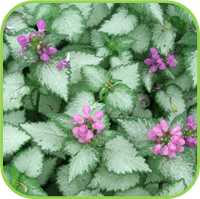 Low trailing groundcover with attractive foliage. Flowering in spring and summer. ‘Lutea’: Cream and green foliage with yellow flowers. Silver and green foliage with mauve flowers. Cream and green foliage with a silver stripe down the middle and pink flowers. Grey-green foliage with pink flowers. Silver foliage with white flowers. 3L bag . Ground cover. H:25cm W:30cm. An aromatic tree bearing shiny dark green leaves. Deep purple berries follow inconspicuous yellowish flowers in spring. The leaves, dried or fresh, are used to flavor soups and stews. Also used to cook game and in pickling brines. 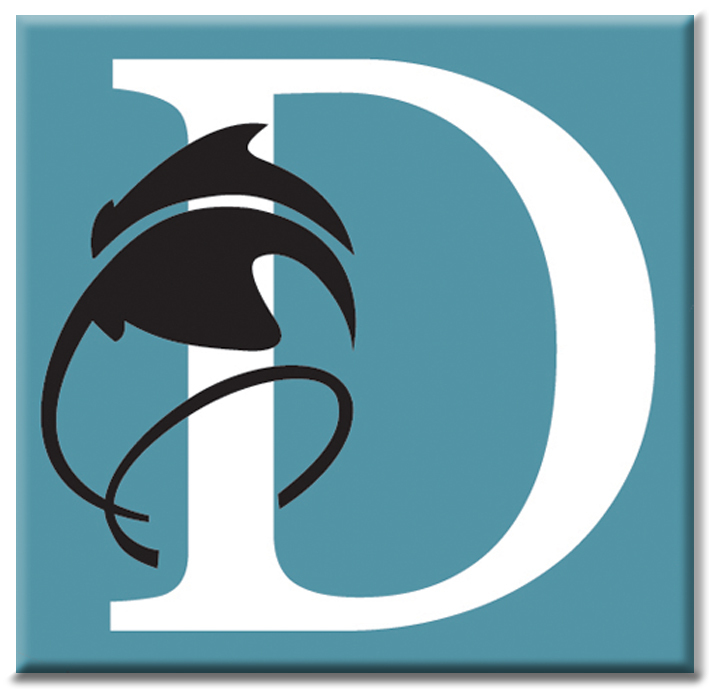 10L. Perennial. H:2m W:1m. 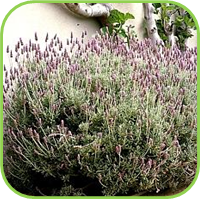 An herbaceous shrub with highly aromatic grey leaves. Small blue flowers are borne on long stems from spring through to autumn. 4L bag 25cm pot. Shrub. H:80cm W:50cm. Spectacular en-mass with grey foliage and long, conical purple flower spikes. 4L bag. Shrub. H:1.5m WL:1.5m. 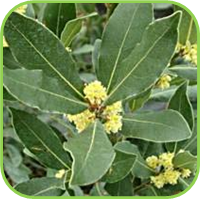 An herbaceous shrub with highly aromatic grey leaves. 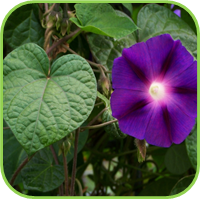 Large purple flowers are borne on long stems from spring through to autumn. 4L bag. Shrub. H:60cm W:40cm. 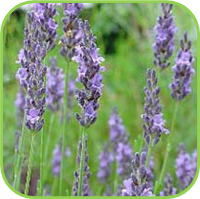 Compact lavender with mass flower display from late winter to early autumn. 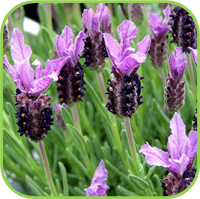 The flower bracts are long with a strong purple colour and the leaves highly aromatic. 4L bag. Shrub. H:60cm W:40cm. 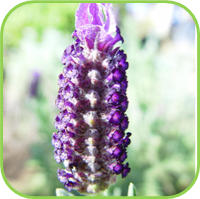 Pale gray-green lacey fern-like leaves with bright blue, soft flower spikes on tall stems make this a very attractive Lavender. 4L bag. Shrub. H:60cm W:40cm. 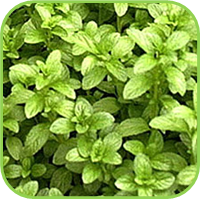 An herbaceous shrub with highly aromatic green leaves. 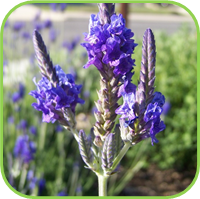 Large purple-blue flowers are borne on long stems from spring through to autumn. 4L bag. Shrub. H:80cm W:60cm. 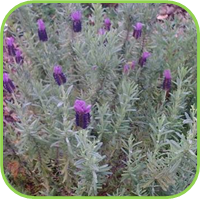 An herbaceous shrub with highly aromatic green leaves. 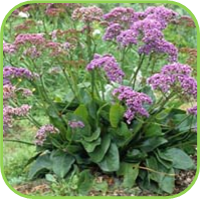 Large purple flowers are borne long stems from spring through to autumn. 4L bag. Shrub. H:80cm W:60cm. 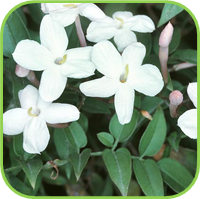 The narrow, ribbon like, leafy fragrant stalks grow in clumps. The leaves swell slightly at the base to form a fleshy stolon. The sweet-sour lemony flavor of the leaves add zest to teas and marinade. The fleshy stolon is used in curries, fish dishes and Thai cooking. Medicinal. 4L bag. Perennial. H:1.2m W:1m. Tough clump-forming plant with big round leaves and tall strong flower stems with huge panicles of deep blue flowers most of the year. Excellent cut flower and the flowers heads dry well. 3L bag. Perennial. H:50cm W:50cm. 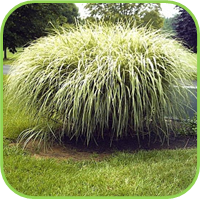 A clump-forming, tuft, grass-like perennial with long, dark-green leaves and long flower spikes of flowers followed by blue berries. 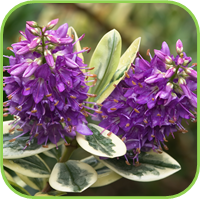 White and green striped foliage with purple flowers. ‘Variegata’: Yellow and green foliage with small violet coloured flowers. ‘White’: White flowers. 3L bag. Grass. H:30cm W:30cm. Deep red foliage with bright red tubular flowers. Bright red flowers. A clump-forming perennial with long, strong flowering spikes from spring to autumn. 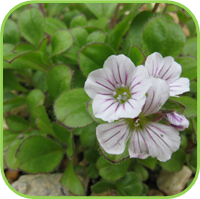 It is low maintenance, easy to grow and a great cut-flower. It is dormant in winter. 3L bag. Perennial. H:60cm W:40cm. 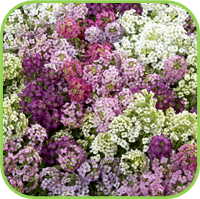 The highly scented Lobularia Stream series has all the attributes which made Sweet Allyssum so popular and more. It is perennial and will last for much longer. It will also grow much larger and spread further and is a non-stop flowerer. 17 cm pot. Perennial. H:20cm W:20cm. The stunning, brightly colored, unusually shaped blooms of the evergreen trailing plant Lotus berthelotii, commonly called parrot’s beak, brings a tropical feel to your garden or landscape. 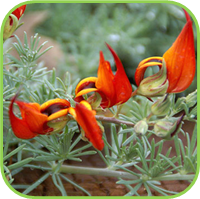 Parrot’s beak is a sun-loving perennial that flowers from early spring to late summer against a backdrop of silver, needle shaped leaves. 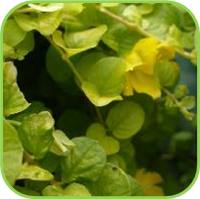 Ideal for containers and hanging baskets where it can freely cascade over the sides. 17cm Pot. Ground cover. H:10cm W:spread. 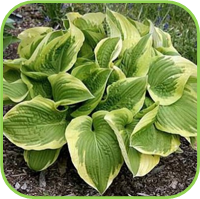 Very flat spreading self-rooting ground cover with round bright green foliage and big yellow cup shaped flowers in summer. 3L bag. Ground cover. H:10cm W:spread. 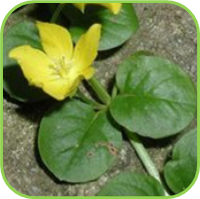 Very flat spreading self-rooting ground cover with round bright yellow foliage and big yellow cup shaped flowers in summer. 3L bag. Ground cover. H:10cm W:spread. 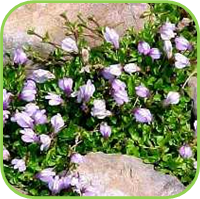 A very flat, hardy, creeping self-rooting ground cover that bears masses of small flowers with yellow and white markings in spring and summer. 3L bag. Ground cover. H:10cm W:spread. Upright growth with purple flowers in summer. 3L bag. Ground cover. H5cm W:spread. 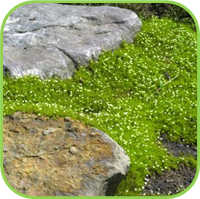 Very flat, compact, neatly spreading moss-like ground cover with golden yellow foliage and tiny white flowers in summer. 3L bag. Ground cover. H:10cm W:40cm. 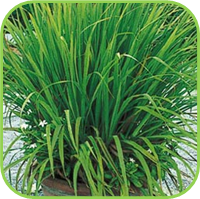 A highly decorative grass with a distinctive, whitish band along each margin of the leaves, displaying a variegated effect. Leaves droop and weep toward the ground. Slender leaves originate in a clump, spreading out and up like a fountain. 4L bag. Grass. H:1m W:80cm. 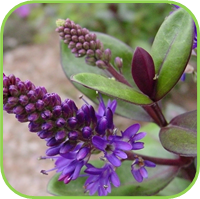 Compact shrub with small dark green leaves that bears small creamy flowers in summer followed by dark purple berries. 3L bag. Shrub. H:1m W:0.8m.